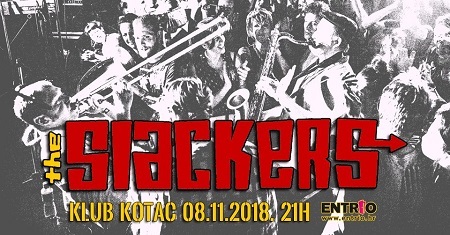 Već više od 27 godina hvaljeni njujorški bend The Slackers obilaze svijet svojom mješavinom ska, reggae i soul glazbe. Od 1990. godina objavili su 15 albuma i bezbroj singlova, a svojim energičnim nastupima iznova hrane fanove. Tisak se također slaže: "For some bands, hitting 25 years together seems light years away. For The Slackers, it's a cause for celebration. The band is deeply rooted within the ska movement, while their self-proclaimed "Jamaican Rock'n'Roll" sound sets them apart from many bands today." (Modern Vinyl). Mnogi navode... the Slackers are "the best ska band in the world" (Rude International), "the pick of the US crop" (Metal Hammer), "the sound of New York' (New York Times), "is about as close to perfect as it gets" (Ink 19), and "one of the best bands in the United States" (axs.com). [najawa] THE SLACKERS @ KSET, 27.10.2009.